Lending capacity of banks will improve as their capital adequacy improves, the finance minister said. Finance Minister Arun Jaitley on Thursday said that “fixing and strengthening” the public sector banks is the most important agenda before the government to ensure that the lenders are able to support growth. 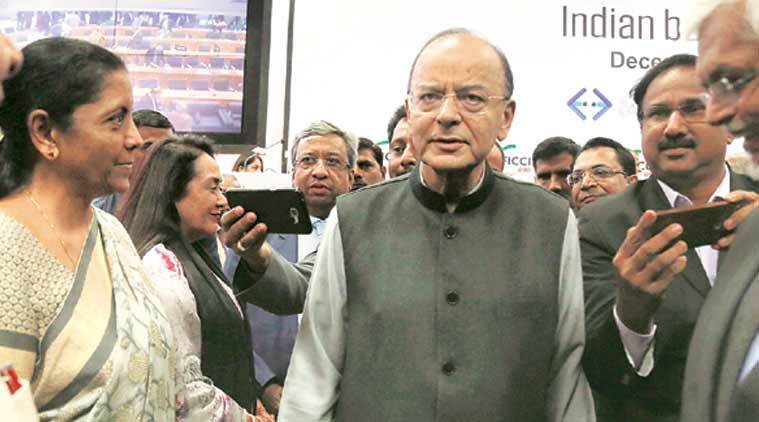 The government envisages expeditious resolution of stressed assets under the Bankruptcy Code that aims at time-bound resolution, Jaitley said adding that the government would exceed the disinvestment target this year for the first time. “Fixing the banks and completing the task of strengthening the public banks I think is unquestionably one of the most important agenda today. We have announced the recapitalisation plans and the idea behind this is to ensure that ability of banks to support growth, their lending capacity more particularly as far as MSME sector is concerned needs to be enhanced. This sector has been at the receiving end in last few years particularly with lending capacity of banks being depleted as a result of NPAs. The lending capacity of banks will improve as their capital adequacy improves,” Jaitley said. The government in October announced a plan to infuse Rs 2.11 lakh crore in public banks over two years. Of this, Rs 1.35 lakh crore will be via recapitalisation bonds. Remaining Rs 76,000 crore will be raised by banks from market and provided by the government through budgetary support. To a query by a participant, who identified himself as a lawyer, on whether stressed asset resolution is possible within a tight window of six months for resolution of NPA cases under the Bankruptcy Code, Jaitley said: “Well I think if you stop thinking like lawyers, it can happen.” He said there is a need for expeditious resolution of NPA cases in order to ensure that the banks’ lending capacity is restored. “For the simple reason that if an asset has been mismanaged or an asset is incapable of being managed by a particular management, then the whole object is that the exercise of its resolution must take place expeditiously. Otherwise if you allow the status quo, it’s starved of funds, its net worth is eroding and if you allow it to continue then you are only perpetuating the problem and making it unresolvable. But if at the appropriate time you enter expeditiously and expeditiously you either allow the same promoter to continue, if he is capable of resolution, and if it’s not capable of resolution and you find another resolution, then it has to be done fast. You see courts are used to delay but assets can rust away if it is delayed. And therefore I said that if you stop thinking like a lawyer then we realise what the cost of delay in an asset can be,” the minister said. Mounting stressed assets has depleted the capacity of banks to lend and to support growth, Jaitley said, adding that “the convention in India is that it doesn’t matter if you don’t pay.” This kind of relationship between debtor and creditor has to end and to be reversed, he said. The government last month brought out an Ordinance amending the Bankruptcy Code to introduce checks and balances to keep a high quality bar for the kind of companies which will be allowed to takeover companies under resolution. A total of over 300 cases have been admitted for resolution with various benches of the NCLT under the Code, including 12 large cases. On the issue of disinvestment, Jaitley said the government will exceed the budget estimates on receipts from disinvestment. The government has estimated total receipts of Rs 72,500 crore from stake sales in government companies. “It is going to be the first year in history where, we are going to significantly overtake disinvestment target itself. In India privatisation and disinvestment is art of the possible thing and that had happened all over the world. Air India is moving expeditiously on track right now. The advisors and all are studying the market and universe of buyers and soon will come with the next step,” he said. The finance minister also said that it was also important to keep the momentum of development of urban and rural infrastructure going. Infrastructure development was at the core of India’s growth story, he said, adding that while highways, ports and aviation were growing well, the railways need to speed up its infrastructure development schemes – from railway stations to quality trains and the number of superfast trains. With regard to the development in rural areas, Jaitley said that main focus of expenditure in the next few years would be on housing and sanitation.